Mobile SEO Tools - The Only List You Will Ever Need! Mobile SEO is the set to take the world by storm. With the growing use of mobile devices, site owners have been forced to create mobile friendly versions of their websites in order to grab the attention of the mobile audience. Mobile seo is set for a huge demand in future. This post will list the best mobile seo tools that you can use to make your site more mobile friendly. Mobile Moxie - Gets you result on the basis of functionality, design, accessibility, technical optimization, HTML contents and loading time. This tool is excellent to test the readiness of a website for the mobile users. 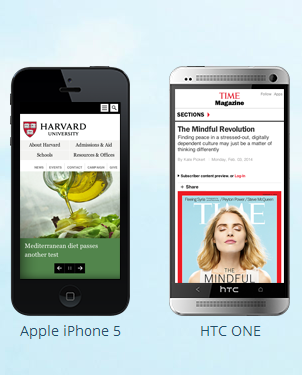 MobileTest.me - It lets you test your websites in smartphone & tablet emulators. It provides a neat display to check the responsiveness of any site. User Agent Switcher - It lets you switch the user agent from the browser itself so that you may check the mobile friendliness of any website. W3C Mobile Validator - One of the important and must have tools that checks the mobile friendliness of any website. It provides really valuable insights regarding the best practices to follow while building a mobile site. It displays detailed report regarding the errors and hoe to fix them. Google Analytics- Allows you to check the mobile traffic to your site. XML-Sitemaps - Generates mobile sitemap for the search engines. PageSpeed Insights - Straight from the house of Google, this tool lets you check the speed of a website on a mobile device and also provides some best suggestions to reduce load time of the site. Screenfly - Lets you test your site on any screen size including desktops, tablets, televisions, and mobile phones. Web Sniffer - Lets you check the response header of a HTTP connection, status codes and HTML source codes. Matt Kersley - Responsive design checker tool. Google Webmasters Tools - Allows you to check the mobile search queries that are sending visits to your site.